Paola Smith is covered in flour and moving lithely hours before most Portlanders have sipped their first coveted cup of coffee. 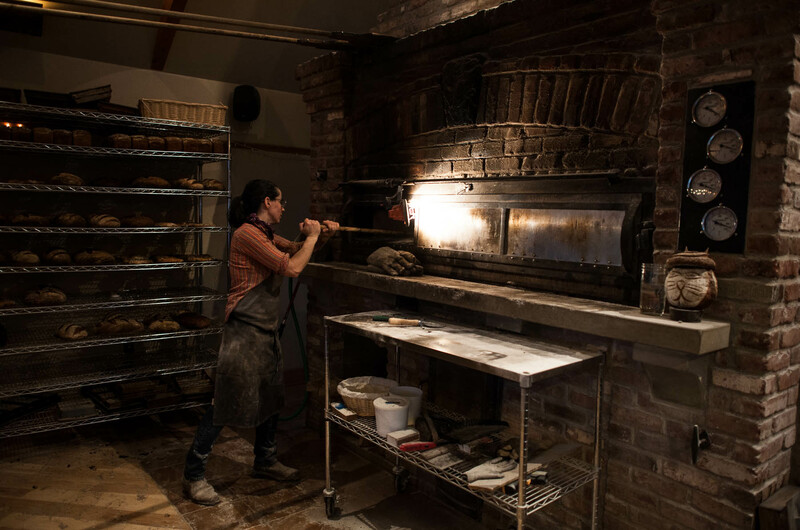 Between 5:30 and 9:30 each morning, Smith, alone except for a few fellow bakery employees and the cranked up sounds of a playlist that shuffles between Bob Dylan and Fleetwood Mac, bakes as many as 200 hundred loaves of bread in Tabor Bread’s massive wood fired oven. 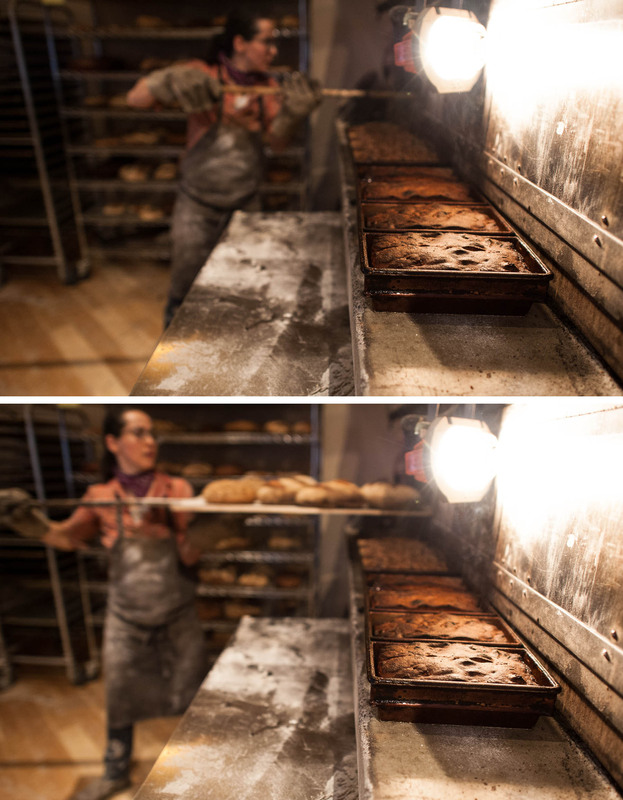 Other bakers across Portland perform parallel tasks, scoring the bread, testing loaves’ temperatures. Yet the bread that’s hoisted out of Tabor Bread’s deep oven on peels so long they could pass as ores differs in several noticeable ways: every loaf, no matter the shape or style, is created exclusively from whole grain flour. And that whole grain flour is milled on premises in a small milling room mere steps away from the oven. 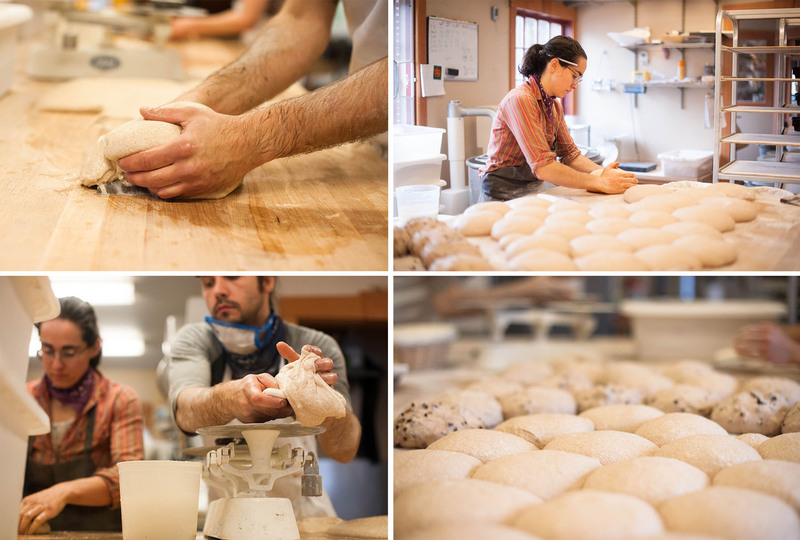 Portland is home to a collection of stellar bakeries – in fact, I’ve heard the city’s bakery scene earnestly cited as a reason to live here – but Tabor Bread is the sole local bakery to bake only with whole grain flours. While Little T and Ken’s Artisan offer several whole grain options or whole grain hybrids along with their white boules and baguettes, you’re out of luck if you stride into Tabor Bread at the end of your workday seeking a white baguette to take home and griddle into crostinis. Instead, your choices may include a dense, tangy loaf of rye bread or a boule made from red fife wheat, bread whose flavors can certainly accompany that desired crostini topping, or can just as easily stand on their own, asserting themselves as more than just a receptacle for a topping or an easy carb punch. No matter your bread choice, the loaf you transport home from Tabor Bread began its life two days earlier. Each morning, Smith bakes off the previous days’ shaped loafs, starting with kamut and rye, while fellow baker Brad Holderfield follows a structured schedule that includes milling the necessary flour (Tabor Bread uses around 200 pounds of flour a day) and transforming the sourdough starter into a levain that will be integrated into various batches of dough. After each variety of dough ferments for 200 minutes, Holderfield and Smith shape the dough into gorgeous round aerated balls. 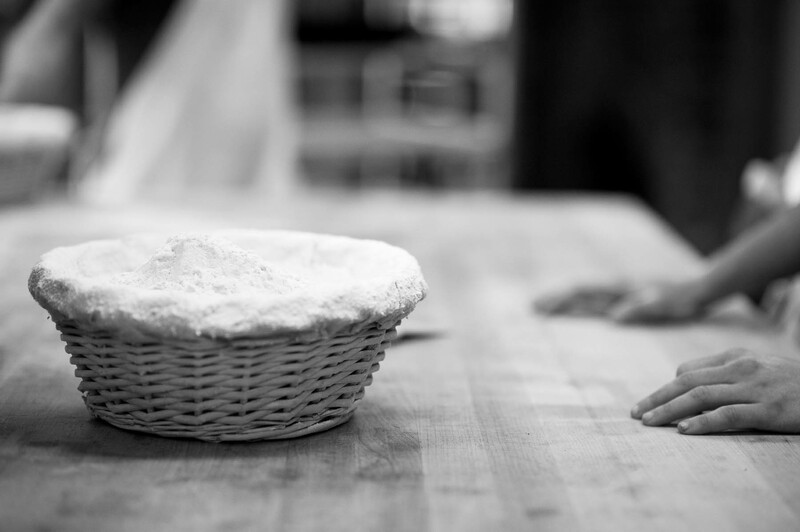 From there, these dough rounds are dipped in flour, set gently into circular proofing baskets and wheeled into a walk-in refrigerator, where they’ll continue to ferment until the following morning, when they’ll be baked and the process will repeat itself. Bread is such a ubiquitous component in food traditions and meals, an accompaniment more than a star, that until relatively recently, America’s public discussion around grains and bread was mostly positioned in two camps: creating bread that’s shelf-stable and rises quickly, or baking bread that’s nutritionally healthy but rarely something you’d enjoy eating. But bread in America is moving beyond such binary distinctions. Bakers and chefs have worked to create businesses with end goals like recreating “the perfect loaf of bread” (Chad Robertson), giving immigrant women outlets to create and sell their culture’s bread (Hot Bread Kitchen), and baking memorably flavored bread with heirloom varieties of grain (Stone Barns). 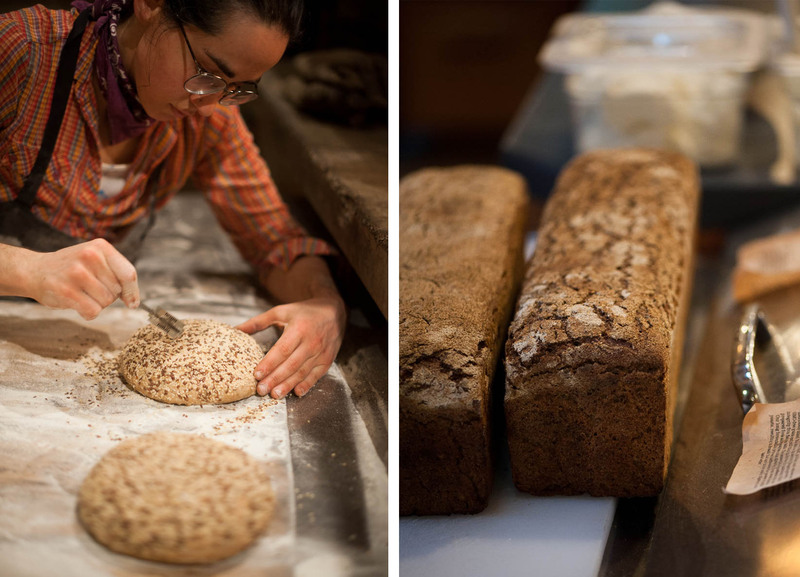 For these bakers and chefs, bread is a vehicle for a much larger conversation, one that spans nutrition, fermentation, and creativity, and exposes gaps both in the public’s knowledge of the word “grain” and in our long-suffering grain economy. Amber waves of grain? Sure, but over one third of these waves are exported to foreign markets, and as of 2011, just .6% of our nation’s wheat harvest was grown organically. Since opening in late 2012, Tabor Bread has sourced their whole grains from Camas Country Mill, Greenwillow Grains, and Dunbar Farms, all Oregon based. They join a collection of bakeries nationwide with similar philosophies to baking and sourcing grain. 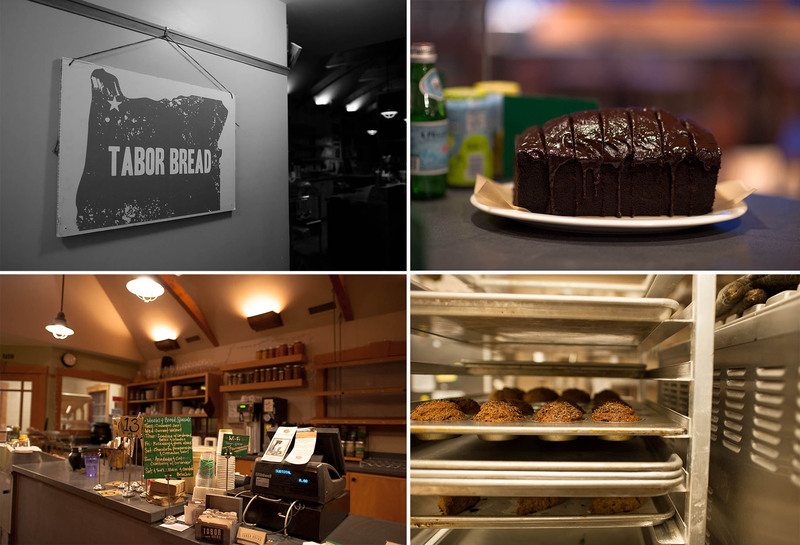 In fact, there’s an article on Tabor Bread’s wall that calls out eleven bakeries, including Tabor Bread, as innovators in naturally fermented and/or whole grain baking. And, like artisanal cheesemakers and chocolatiers, bread is generating a collection of superstar artisans, powered by reviews, cookbooks, sites like The Fresh Loaf, and a fringe yet growing passion to revitalize the wheat economy. Chad Robertson. Richard Bourdon. Jim Lahey. Depending on where you live, and how much you enjoy bread, this isn’t the first time you’ve heard those names. 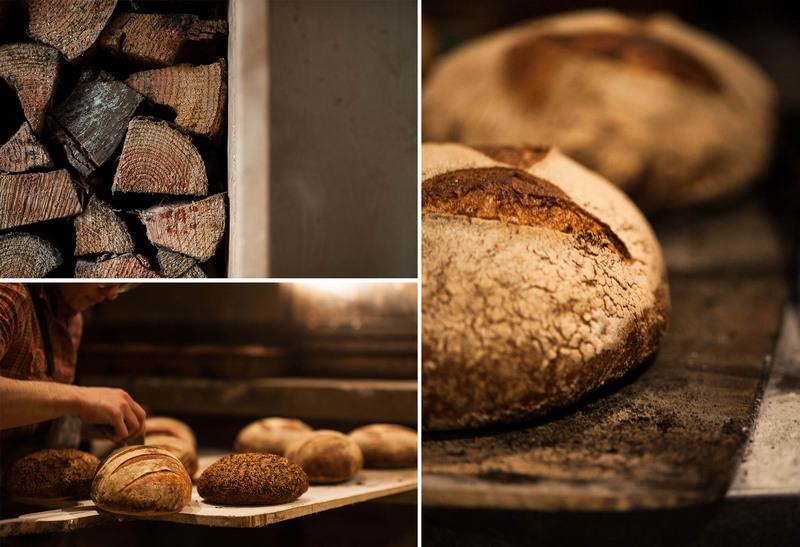 As the bakers at Tartine, Berkshire Mountain Bakery, and Sullivan Street Bakery (respectively), each grew their craft and following over the last few decades, while America’s bread culture veered into a seemingly opposite direction. Even as customers began to rearrange their work schedule in order to line up at 4 pm with the hopes of buying one of the 240 loaves Robertson bakes each day, a diametrically opposite movement began to take hold, too: the rise of gluten intolerance and gluten free foods – a bread backlash, so to speak. One study found that 29% of Americans actively try to avoid gluten, and another hypothesizes that 20 million Americans claim sensitivity to gluten. Yet, in 2014, these seemingly incongruous camps – the bread worshippers and (many of) the bread abstainers – might have similar health and community benefits to gain from the renewed focus on whole grains, grains that are baked as much for flavor as for health, and the accompanying revival of heirloom grains bred and grown locally on a smaller scale. Bread is the product of a fascinating interaction between flour, water, salt, yeast, and other microbes – a simplicity aptly captured in the title of Ken Forkish’s award-winning bread cookbook, although Forkish dropped the microbes from his title. I’ve now been baking bread for six months, and it still seems like a magical process that I’m only just beginning to understand. I’m not alone: when I tell other people I bake bread, the most common question I’m asked is if I have a bread machine. From these four (or five, if you count the bacteria and yeast communities as one unit) ingredients, a world of salivating choices presents itself: baguettes, brioche, croissants, ciabatta, english muffins, country loaves with olives, country loaves with walnuts - well, country loaves with just about anything. How is it possible to create so many variations of bread from so few ingredients? The answer lies in the way a baker manipulates fermentation: bakers like Tabor Bread’s Smith make reasoned and tested choices related to time, temperature, and flour, from how long to proof the dough, to the water temperature mixed into the dough, to the variety of flour used and how coarsely it should be milled. Yet the end result of a properly fermented, naturally leavened loaf of bread isn’t always predictable: a batch of loaves may all bake in a nearly identical fashion, but if a factor is off, such as bake time, oven temperature, or a minor transformation in the invisible network of microbes, the resulting bread may exit the oven looking and tasting differently than expected. Our country’s consolidated network of restaurants, grocery stores, and distributors demand consistent, predictable products. Safeway has no desire to sell 300 loaves of bread that don’t look or taste identical to each other. The “solution” to time-consuming sourdough fermentation, starter maintenance, and occasionally unpredictable bread is to tease apart the natural fermentation process, that complicated interplay of bacteria and yeasts and unlocked nutrition, and rebuild it from its component parts. A naturally leavened loaf is one that uses a sourdough starter instead of commercially available yeast. When flour is stirred with warm water (a process known as autolyse), the water activates dormant microbes, proteins, and enzymes already on the surface of the flour particles. In the case of wheat, rye, and barley, two of those proteins, glutenin and gliadin, form into interlocking strands called gluten. Two particular enzymes, amylase and protease, work in tandem to break down flour’s complex carbohydrates into simple sugars (maltose and glucose) for yeasts and bacteria to dine on and to degrade gluten forming proteins, which allow the dough to be stretched and hold its shape. These yeasts (either wild yeasts cultivated by feeding a sourdough starter, or a starter commercial yeast under the name S. Cerevisiae) and bacterias (including one by the name of L. Sanfranciscensis) consume sugars and expel different waste products. (In a sourdough culture, there are roughly 20 different yeasts, and 50 different bacteria, all interacting in similar relationships.) Yeast excretes carbon dioxide and alcohol; bacteria excretes lactic acid, acetic acid, and glucose. The highly acid-tolerant yeasts thrive in the acidic environment created by the lactic acid bacteria, while this same acidity prevents other microbes (perhaps ones detrimental to the health of the dough) to gain a foothold. As yeasts die, their proteins become amino acids that help the lactic acid bacteria proliferate. In addition to a loaf of perfectly risen, crackling bread (if you’re lucky! ), you’ve also actively shaped a transformation, turning a few ingredients into something greater: bread is 80% air...but that air is hardly worthless. In addition to the flavor compounds in the bread, a long fermentation of the dough can unlock previously inaccessible minerals, including iron, zinc, and magnesium. Though commercial bread will reliably rise, a reliance on an isolated yeast culture in the absence of an extended fermentation means that these bakery factories must add other ingredients into the dough to achieve predictable taste and texture, and to fortify breads with vitamins that would have naturally occurred when a wet dough is bulk fermented. It took thousands of years of accidental crosses and mutations before gluten came into the world. The proteins gliadin and glutenin are found in varieties of wheat, rye, and barley (but not in grains like teff and kamut). When moistened in water, the proteins combine to form gluten, which leads to extensibility (thanks to gliadin) and elasticity (thanks to glutenin) in the dough. The resulting gluten traps carbon dioxide that the yeasts expel – without it, bread would collapse instead of rising. In order to have a similar spring, gluten-free flours like teff must be mixed with a flour that contains gluten. Or gluten-free bakers and bakeries will create gluten-free flour composites with ingredients like baking powder and xantham gum to simulate gluten’s properties. But as these daily conversations that take place at Tabor Bread demonstrate, both unequivocal gluten lovers and those who shy away from gluten because of health concerns or painful intestinal reactions (by which I mean the gluten sensitive, not the smaller percentage of people with diagnosed celiac disease) have a reason to seek out naturally fermented whole grain bread. Bakers like Robertson and Bourdon believe that the spike in gluten intolerance can be attributed to the lack of focus on an extended, bulk fermentation, resulting in harder to digest bread. Robertson writes that an extended fermentation “tenderizes” gluten, making the protein easier to absorb. All whole grains contain phytic acid, the grain’s defense against an animal (like you) eating it. Phytic acid reduces the absorption of essential minerals like calcium, iron, and zinc. A long sourdough fermentation unlocks the phytic acid and frees up valuable minerals that were previously inaccessible. Additionally, a sourdough culture produces organic acids that slow our bodies’ absorption of sugars. And an extremely wet dough (measured by bakers as the bread’s hydration percentage) can stimulate beneficial organic compounds, activate latent microbes that exist on the grain, improve the bake of the bread, and extend a bread’s shelf life. For example, Tabor Bread’s spelt flour is mixed at 113% hydration, meaning that there’s 13% more water than flour by weight in the dough. A concurrent reason for gluten sensitivity and that debilitating sugar crash that can come after eating a piece of bread for an afternoon snack is partially a result of the kind of grain that producers mill into flour. White flour has been the norm now for centuries, originally created for its shelf stability (and later elevated to an aristocratic norm, while the peasants were forced to “make do” with brown bread). Most of us have a sweet tooth – it’s okay, we’re hardwired to – and refined flour is really just one giant milled carbohydrate. A grain is comprised of three main parts: the bran, germ, and endosperm. The bran is the outer layer of the seed, full of B vitamins and minerals. The germ is the part of the seed that could ultimately become another plant, and is thus rich in antioxidants, Vitamin E and healthy fats. And finally, the endosperm is chock full of carbohydrates, all designed to feed and nurture the germ. After wheat is thrashed, millers frequently sheer off the bran and germ because each component contributes to a higher risk of rancidity and flavor variations. Michael Pollan writes that the prominence of refined, white flour led to wheat breeders and growers switching to wheat species with large endosperms and germs and brans that are relatively easy to remove. Over the past half century, heirloom grains with greater unpredictability in their yield were replaced with grains like hard kerneled red wheat, and wheat breeders began to “select against health”. Instead of beneficial factors like nutrition and flavor, modern wheat varieties are adapted for high yield and high gluten content. Though you may have recognized the bakers’ names when I wrote a similar list a few paragraphs earlier, how familiar are you with wheat varieties like Einkorn, Emmer, Russian Beardless, and Mirabella? Washington State’s Stephen Jones, Stone Barn’s Dan Barber, Community Grains' Bob Klein, and organizations like the Northeast Organic Wheat Project could easily rattle off unique characteristics of these heirloom varieties – and they want you to be able to, as well. Nationwide, pockets of enthusiastic, innovative businesses have formed to research heirloom varieties of grain, mill these varieties, and create appealing products that drive demand for more of these whole grains. And if Bon Appetit – a publication that has never found a subject they can’t turn into a list post – is able to come up with a list of Best Heirloom Wheat Producers, the tide of awareness of wheat and grain as more than a commodity may already be rising. During my morning at Tabor Bread, I talked to Smith in between her trips to the walk in, our conversation occasionally drowned out by the slamming of the oven doors. Baking is a sensitive mix of method, trust, and intuition – observe a baker like Smith and you can intrinsically see that this isn’t a craft that should be automated or industrialized. 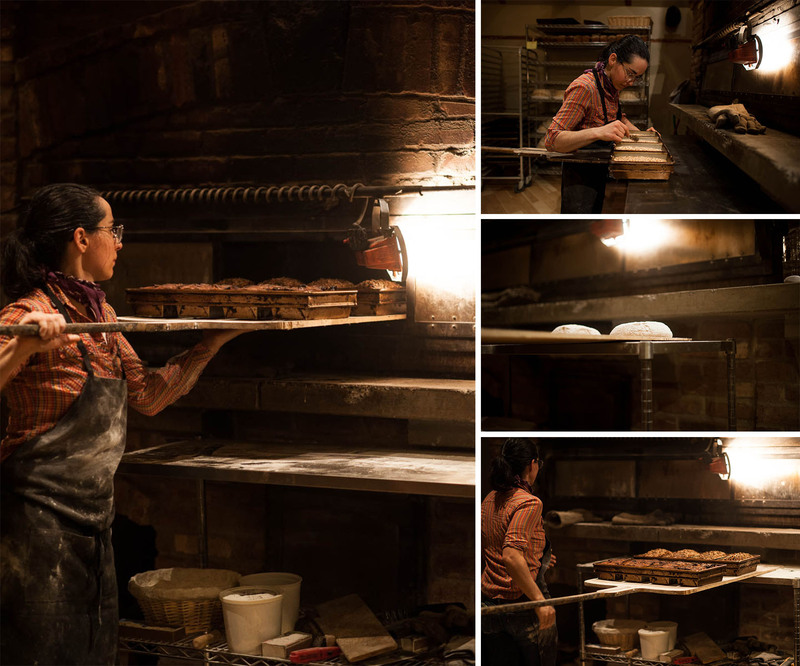 While baking has a methodical, predictable side (Smith follows a similar schedule each day: prepping the oven, checking the breads’ temperature, and standing on her feet between three and five hours during the main bake), much of her role is about creating harmony between the dough and the oven, while focusing on building flavors. Instead of churning out as many loaves as possible, Smith knows how different flours feel, how their protein content effects both the shaping and the bake, and which loaves tend to be more unpredictable than others. Several years ago, Jim Lahey of Sullivan Street Bakery, despite baking with whole grains successfully, shared that the bread at Sullivan Street is made with flour from ConAgra. That a notable baker like Lahey, with a Manhattan customer base fairly impervious to cost, chooses to use industrial flour illustrates several hurdles smaller grain producers and millers encounter. Wheat and grain are still stubbornly stuck in commodity land: infrastructure doesn’t exist to meet everyone’s demand. A small bakery like Tabor Bread has ordered all of Camas Mill’s grain supply for the rest of the year. 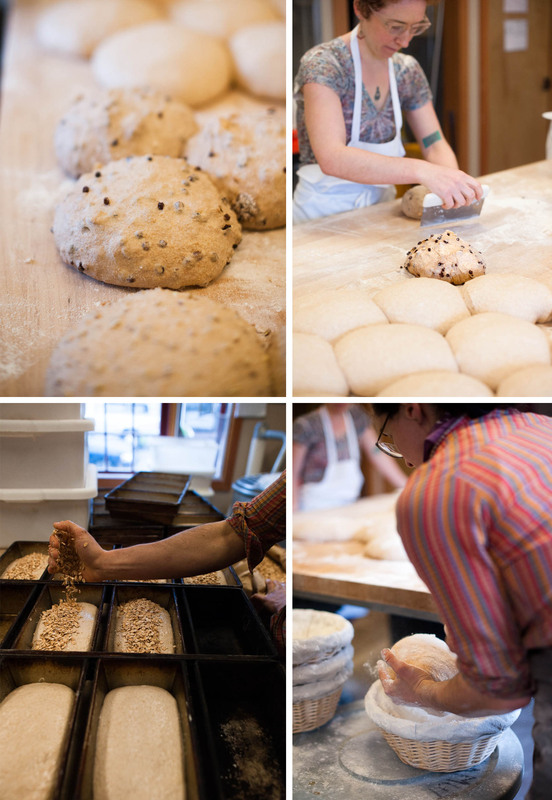 What if there was another Tabor-Bread-type bakery in Portland? Where would they get their grain? Several years ago in New York, one baker asked Elizabeth Dyck, coordinator of the Organic Growers’ Research and Information-Sharing Network, how he could obtain 30,000 pounds of Warthog wheat. The answer: only one test acre had been grown. 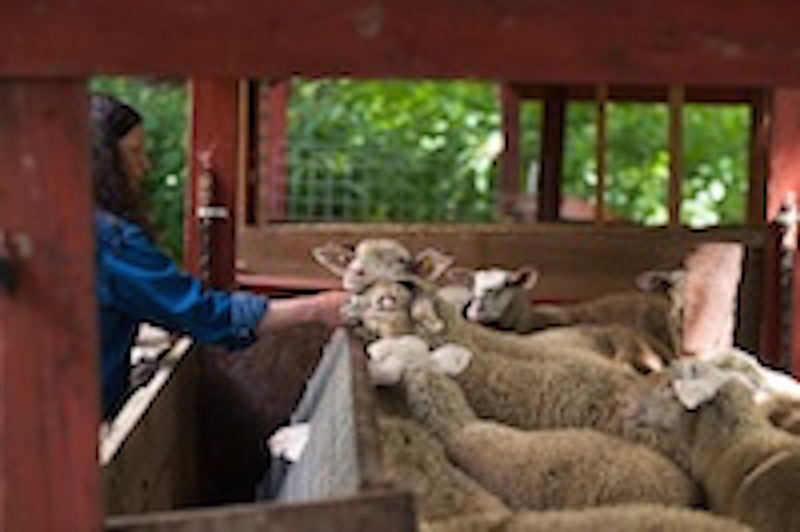 Much as a pastured meat farmer may wish to expand her herd but lacks the slaughter and distribution infrastructure to do so, a bakery interested in transitioning to whole grains still faces a less than ideal supply. Complicating matters further, many bakers still create their products by focusing on the end result and not necessarily the base ingredient. It’s become second nature for chefs to choose the best ingredients before transforming them into something surreal through their own skills and talents. But for some bakers, it’s not at all about the flour. At a 2010 discussion organized by the Northeast Organic Wheat Project, Lahey discussed his experience baking with different grains, concluding that making great bread is about the skill of the baker, not the wheat that goes into it. He told the audience that skilled bakers know when dough needs more or less water, longer or shorter autolysis, or stronger fermentations. 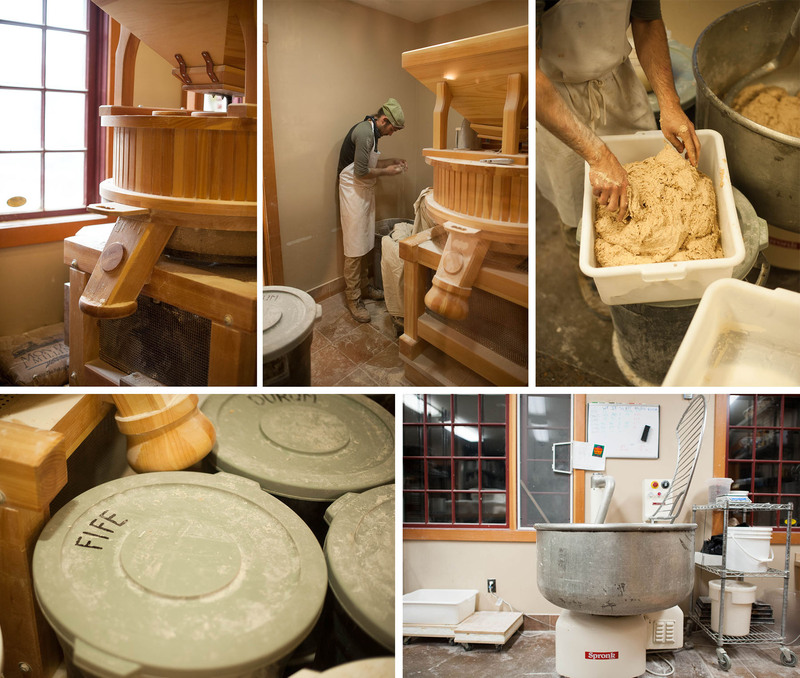 I’m in awe of any baker who feels confident enough to bake with a variety of flours – a challenge Smith takes on daily. And I appreciate the focus on taste and flavor, and enjoyed eating Sullivan Street’s bread when I lived in New York. But these recent movements to revive grain economies and increase the production of heirloom varieties are about more than taste: it’s also about health, not just of the consumer, but of the soil and communities around the fields of grain. When I mentioned Lahey’s comments to Smith, she eloquently explained her own relationship with grain and flour. Smith, in a previous career, was a vegetable farmer in Baltimore, and now considers baking as akin to being a “landless farmer”. As a baker, she applies similar agricultural principles to her daily routine, with knowledge that an excellent end product depends on its earliest stages. After all, a dairy farmer can be aware of the health of his cows, but if he’s feeding the animals a nutritionally poor diet or housing them on concrete floors, he may still have to feed the cow antibiotics to counteract the detrimental environment. A final food item, whether that’s a cup of milk or a slice of bread, will taste more pleasing and be more nutritionally sound when its creator focuses on every factor surrounding the base ingredient, not just the flavor of the final product. For Smith, baking isn’t just about her breadth of knowledge or the robustness of the flour she uses, but rather a collaboration between her intuition and the grain’s characteristics. As she works with a variety of whole grains, each ferment, bench rest, and subsequent bake aims to highlight the unique identity of the specific grain. Whole grains seem poised to move beyond their current position in niche bakeries or as a dutiful snack and into broader public awareness, thanks in part to dedicated work from breeders like Dr. Stephen Jones, millers like Camas and Greenwillow, and bakers who create flavorful breads that engage customers for reasons that extend beyond taste. 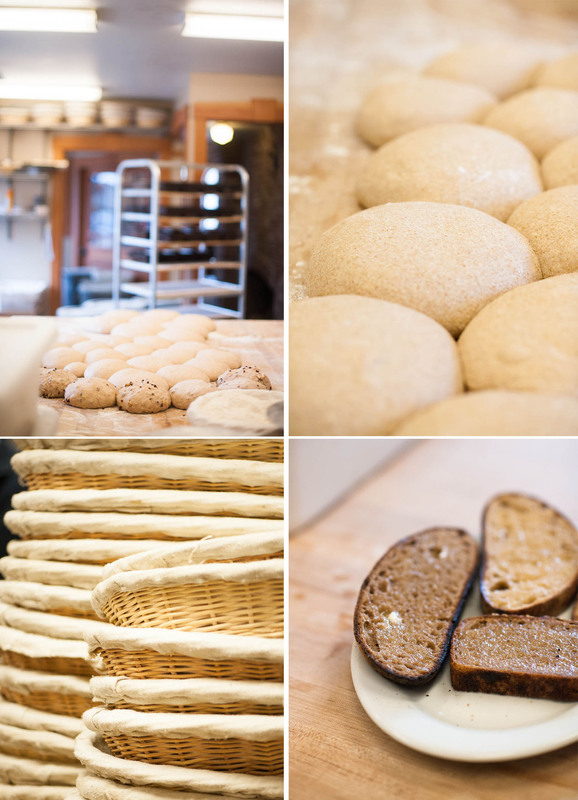 In Portland, Tabor Bread shines as the most dedicated member of this movement, but whole grains will only expand beyond their narrow market when more bakeries feel compelled to seek out whole grains and different varieties of wheat – not out of duty, but out of enthusiasm. Demand and infrastructure are intimately linked, and whole grain bakers, especially those who view themselves as “landless farmers” like Smith, find themselves at an interesting crossroads. Because of these bakers’ skills in developing memorable flavors, their products have the ability to generate discussions that span a diverse number of topics, from grain variety, to harvest date, to fermentation length. And these discussions and subsequent demand have the power to lead to greater awareness of bread as more than just an accompaniment to another food. All bread lovers, including those with gluten sensitivity, should someday be able to taste bread baked with its own identity.